Twenty years ago, Alexander Kreher wrote one of the first articles on EU agencies arguing for the growing importance of this ‘institutional phenomenon’, which was almost completely ignored within the academic literature of that time. 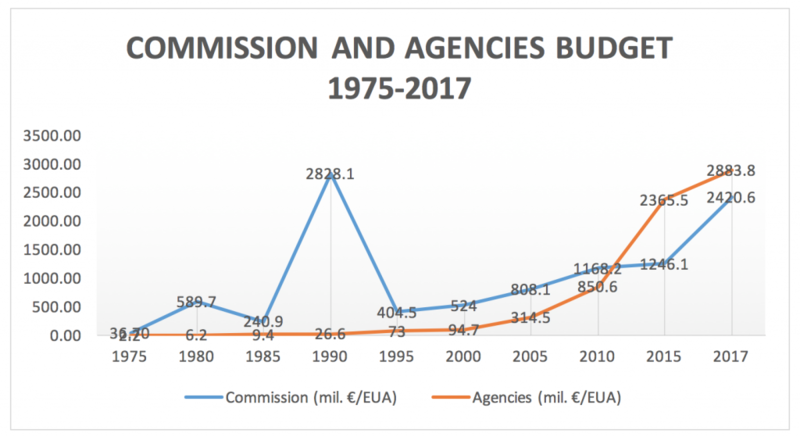 Judging from the countless number of academic articles and the tremendous growth of the cumulative budget (via-s-via the Commission, see Figure 1), it seems that the importance of EU agencies has only grown. The emevelopment in researching and governing EU Agencies has gone from gathering the somewhat scattered creations of agencies in different policy areas, under different treaty provisions, with different powers and for different purposes, etc. to bringing them under one ‘EU agencies’ umbrella as part of the EU executive machinery distinct from the EU Commission. Indeed, EU agencies have been treated as an ensemble for the budgetary purposes, also at the European Parliament, where the practice of three agencies’ directors would defend budgetary proposals on behalf of all ‘EU agencies’. We have seen the creation of the ‘Common Approach’ and later a roadmap with a view of streamlining the creation and revision of the founding acts of EU agencies. Furthermore, EU agencies’ directors have organized themselves in a network of agencies’ directors to discuss common challenges. To what extent, however, should we treat them as one? This blog post argues that while it may make sense to treat EU agencies as ‘one’ for issues such as common Human Resources and recruiting policies or other administrative issues, we should be cautious about not overdoing the ‘centralization-harmonization’ exercise. Not all EU agencies are the same and it is ‘okay’: they have been created for different purposes and with different powers. For some purposes, it does make sense to ‘differentiate’ among them for research and regulatory purposes, to be able to tackle effectively challenges that only some are facing. To this end, this blog post offers some food for thought as to when and how it could make sense to cluster them for research and regulatory purposes, including within the network of agencies’ directors and by the EU main institutions. When and why can it be advantageous to treat EU agencies as one? The streamlining process can be effective in developing common governance principles and administrative systems for EU agencies. In this light a number of governance-related points laid down in the Common Approach are essential: connecting the creation and closure of agencies to an impact assessment strategy; aligning their accountability obligations, including reporting and hearings mechanisms and linking the ex-ante programming to the ex post reporting; introducing a similar system of sunset, evaluation or review clauses; developing certain common organization structures; and promoting mechanisms of cooperation to share (administrative) resources for the sake of efficiency. Indeed, why should each individual agency ‘invent’ the governance wheel all over? Moreover, considering the legitimacy concerns surrounding the institution-building and operation of the EU, such a common approach towards EU agencies, an ‘executive tool’ for regulation and enforcement in the EU, is certainly a plus. Please, note, however, that the non-binding ‘Common Approach’ is not necessarily being followed: only 8 decentralised, 6 executives and 1 EIT have had legislative changes done which effectuated the 2012 Common Approach Strategy (see Table 1). Since 2012, 23 EU Agencies (16 decentralised, 6 executives and 1 EIT) have had their founding regulation either amended or repealed. When and why does it make sense to differentiate among them? Here, we propose at least two directions. First, clustering EU agencies in policy areas and studying them as such could be useful for creating better EU policies. Our quick scan of EU agencies’ policy areas identifies at least two big ‘families’. Here, the interplay between these members could be useful in terms of realizing certain common policy goals: a ‘police-security’ group (EUROJUST, ENISA, FRONTEX, EUROPOL, CEPOL, EU-LISA) and a ‘health-safety’ group (EUROFOUND, EU-OSHA, ECDC, EFSA, EMA, EMCDDA, CHAFEA). Identifying and refining such clusters could be useful for developing more effective policies as well as accountability systems with clearer divisions of tasks and responsibilities of different entities accountable for specific parts of a policy-making and executing cycle (‘meta level’ governance and accountability). This calls for a shift of our focus from the so far quite ‘popular’ institutional to a more policy-driven approach in studying EU agencies and determining their added-value. What are the policy goals in a particular sector? What EU agencies (and possibly other actors) are involved in realization of those goals? To what extent is the work of individual agencies and actors complementary to one another? Are there (undesirable) overlaps? If so, how can we readjust relevant mandates and tasks? Can we attain the envisaged policy goals with the identified ‘(EU) agencies’ team’? Research in this direction seems lacking and the existing ‘tunnel’ vision of the common approach may create an unnecessary hurdle to explore actively diversity and its positive implications in this respect. Second, clustering EU agencies from the functional perspective for the purposes of addressing specific challenges characterizing only a specific functional cluster of agencies could promote addressing such challenges and come up with ‘mini common approaches’ on such specific challenges. An increasing number of EU agencies have been gaining direct enforcement powers, i.e., powers to monitor application of EU law by private actors, investigate possible cases of non-compliance, and sanction to violations of EU law. This trend is ongoing given the pending proposals to enhance enforcement mandate of the European Aviation Safety Agency and that of the three financial agencies. The emerging research on the existing EEAs have showed the challenges that EEAs entities (may) face in ensuring democratic and judicial accountability and procedural safeguards. The fact that these challenges cross the boundaries of individual agencies and even policy areas necessitates the ‘agencies clustering’ to address such ‘horizontal’ challenges effectively. Let us conclude with a somewhat ironic note. Since 1997, the academic and regulatory effort has been to gather EU agencies all together and streamline their operation. Now, 20 years later, do we suggest that the effort has been useless and that we shall ‘go back in time’? No, certainly not. The point that we wish to raise is to warn about possible ‘overlabeling’ of EU agencies as one. They are different which is ‘okay’ in the sense that difference alone is not necessarily a problem (though adverse effects from some of such difference can be a problem). We wish to stress that it also could be beneficial to differentiate among them to cluster them in further research, their possible collaboration and regulatory practice concerning them, in order to develop better policies and promote the protection of our core values. Ms. Laura Frederika Lalíková is an alumni of Utrecht University where she studied Masters in European Union Law and was a student-assistant to the NWO-funded ‘veni’ project of Dr. Miroslava Scholten, who is an Associate Professor of EU law at Utrecht University and a member of the Utrecht Centre for Regulation and Enforcement in Europe (RENFORCE). The main argument of the blog post has been inspired by a productive meeting at the ‘TARN Dialogue Event’ (Brussels, 21 September 2017). Het onderzoek van Miroslava Scholten richt zich op de vormen en het institutionele ontwerp van regelgeving en handhaving van beleid en wetgeving op EU niveau. Haar expertise omvat de thema's democratische legitimiteit en politieke verantwoordelijkheid van onafhankelijke instanties in de EU en de VS.